I have always loved this pattern whenever I see a picture on the web so decided to make one in a color wheel.m I didn't have a pattern. I used my Zimmerman 8" Easy Dresden template (18 degree) because I wanted 20 wedges....then I just made my own applique pieces. One can certainly go crazy with adding fun stuff to your neighborhood like trees, floral's, flags etc..... I did make a church but limited the fun embellishment because I wanted the color wheel to be primary focus. 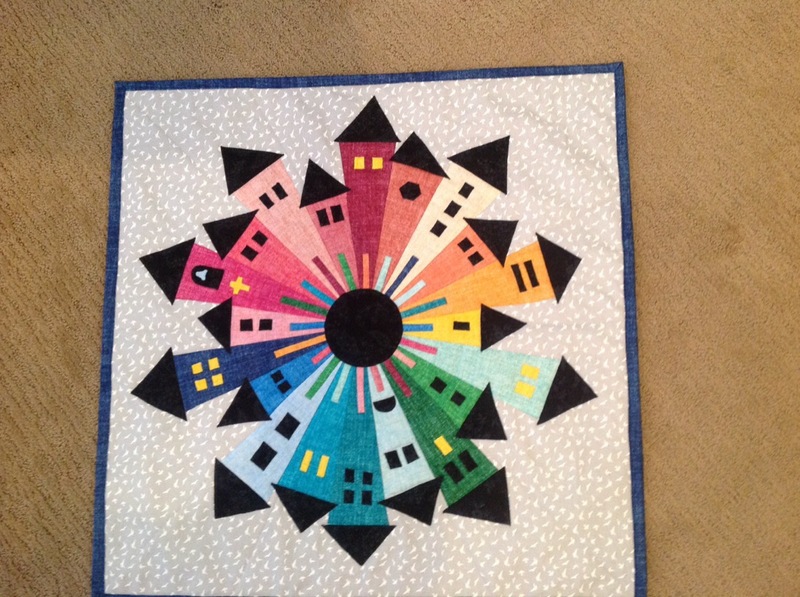 However, wouldn't it be fun to make 4 different neighborhoods representing each season and make a quilt? Or using "sky" background fabric. The ideas are endless. This is 24" squared and is mostly a wall hanging but I made this into a giant pillow for my front entry bench. I ordered a 24" pillow form so it was easy enough to do a pocket pillow. Anywhoooo..applique is turned edge and machine sewn using monofilliment clear and smoke colors from Superior Threads. I'm going to make another one as a gift for my real estate agent....when he sells my house. Lol!! Perfect gift for a real estate agent don't you think? Last edited by Teen; 02-07-2019 at 02:02 PM. Teen!!! Oh my goodness, I am going to call you Queen of mini's. This is just too adorable. You are very clever to design and figure a pattern on your own. Way to make those tools work for you. Love it! I think it would make a great gift for your real estate agent. I'm not generally a fan of Dresden Plates -but this is the CUTEST pattern I've ever seen in that style! 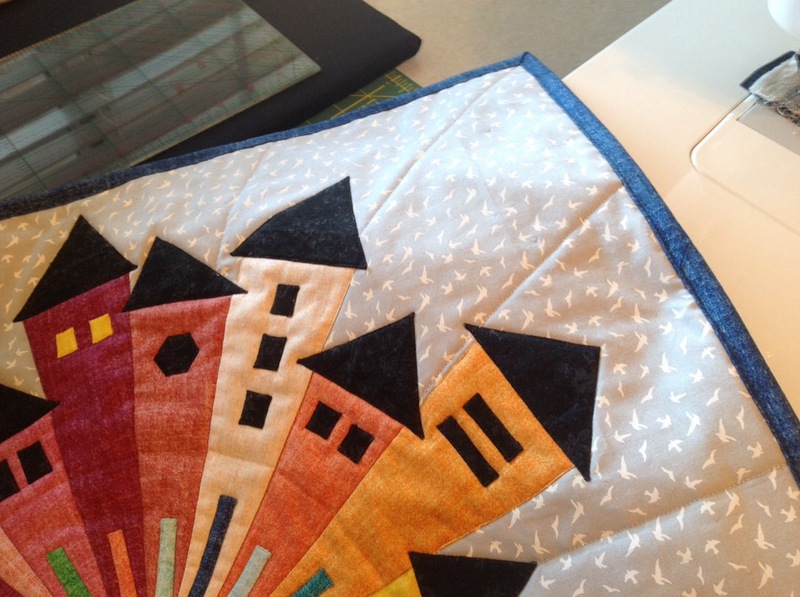 You have great ideas churning there, I love your mini quilt, good luck on getting the home sold! I've seen this done before, but yours is just the neatest...love the color placement, wonky roofs. Just great Teen! Better tease the RE agent and the house will be taken care of! Super Cute! And wonderfully creative on your part to just cut & sew without a pattern! I always love seeing your clean, crisp style - lovely! Sew cute!! You are truly an inspiration! That is great, Teen! It's one of the coolest dresdens I've ever seen. So eye-appealing, colorful and different! So darn cute, Teen. I absolutely love this. Wow, love the houses!! Great pattern. Using the color wheel concept was brilliant!!! Beautiful wall hanging!!! You've said it all !!!! Your Dresden is too cute! Super cute. I think it is certain to be cherished when you give it as a gift. cute, cute, cute...your agent will love this. This is absolutely the best gift ever for a real estate agent!! Love your colors and embellishments - really wonderful.